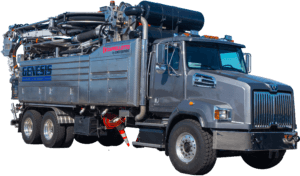 Sewer Equipment, the manufacturer of recognized brands such as Sewer Equipment CO. of America, RAMVAC Vacuum Excavators and Mongoose Jetters, is known for its ability to positively disrupt the marketplace with the introduction of innovative technology. Sewer Equipment’s vision is to make equipment for the customer, not follow the competition. The launch of its popular Model 900 ECO Combination Sewer Cleaner in 2016 is a sure example. This combination truck is most popular for its patented “Hydro Drive” powertrain system, which eliminates the need for a transfer case making it the safest combo truck available on the market today. It also eliminates integration between chassis and module, removing the need for complicated CAN Bus communications. The truck utilizes 12-volt electrical wiring and manual hydraulic controls making it easy to maintain, while the two-step cab engagement and simplistic operator interface using basic switches makes it easy to operate. At Sewer Equipment, simple is the key and continued innovation is the plan. Sewer Equipment’s newest addition to their portfolio of brands and products. The launch of these new products also comes with the launch of a new brand, Cappellotto by Sewer Equipment. Sewer Equipment’s partnership with Italian manufacturer, Cappellotto, was an obvious next step when entering the recycler market. Cappellotto has been utilizing proven recycling technology for over 50 years, which is far superior to the current U.S. offerings, which choose to modify existing combination sewer cleaning products with bolt-on recycling equipment as an after-thought. Cappellotto by Sewer Equipment does it different. The GENESIS is a purpose-built recycling truck that is without peer in the marketplace. The GENESIS caught a lot of attention from customers and manufacturers at this years WWETT Show. The Model 400 Mini Combination Sewer Cleaner by Sewer Equipment Co. of America is the beginning of a whole new market in North America.